Flight operations in the navy are probably, no, undoubtedly, the highest-stakes sort of flying in the world. Taking off and landing on the short deck of a ship which is pitching in the ocean is extreme enough, but then add on to that around-the-clock operations, and extremely high operational tempo. This is not to mention the different conditions posed by different oceans. Naval operations in the North Atlantic will subject flight operations to extreme cold, ice, and frozen salt spray. South Pacific operations subject aircraft and ground support equipment to high heat and extreme humidity, which plays murder on all systems and components, particularly in terms of corrosion. Aside the physical conditions on naval operations, the operations themselves are rigorous and highly demanding. Unlike landside operations, seaside ops aren’t contained to a normal workweek. Naval ops are conducted every day of the week, at all hours of the day and night. The equipment must be robust and able to keep up with such a pounding regimine. 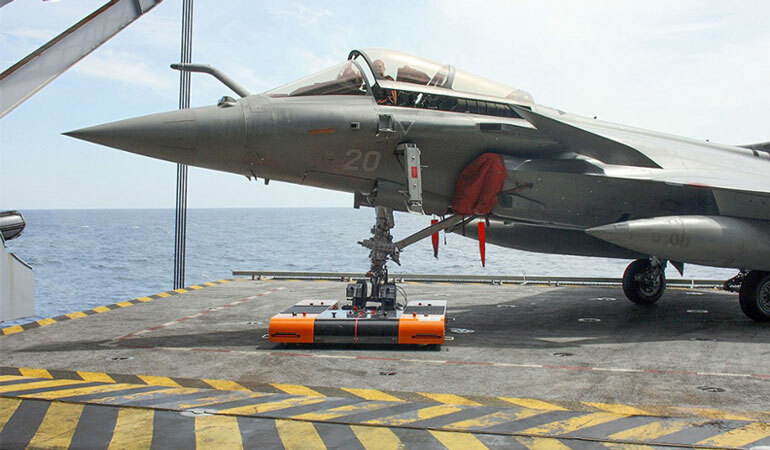 The aircraft are built to a much more demanding standard than strictly landside aircraft, particularly their landing gear which must withstand years of merciless pounding on the carrier deck. What makes naval flight operations interesting and challenging is the diversity of equipment in the naval arsenal. Each aircraft carrier air wing is made up of a conglomeration of different equipment, with rescue and utility helicopters, cargo aircraft, electronic surveillance aircraft, electronic warfare, and fighter/attack aircraft. While aircraft carriers are enormous vessels, they are still very cramped when 75 or more aircraft are housed on them. There is not a lot of spare space to park a bunch different types of ground support equipment. Any opportunity that the navy has to consolidate support equipment for multiple uses is a great blessing. Aircraft tugs represent the greatest opportunity to diversify ground support equipment. Modern remote aircraft tugs are a staggering leap forward in the capabilities offered compared to the gas and diesel tugs of yesteryear. Back to the confined space of an aircraft carrier. An airport landside has painted markings indicating non-movement areas for aircraft movement areas. What happens if you cross them? Not a whole lot. An administrative infraction, or perhaps a tire is damaged by going on inferior pavement. Maybe an aircraft inadvertently goes into the grass. No big deal in the grand scheme of things. The boundary lines on an aircraft carrier have much higher stakes. If you push a wheel across those lines, the aircraft falls off the side of the ship and might just takes the tug (and tug operator) with it. Remote controlled towbarless tugs have never been more appealing, particularly those which have Automatic Guided Vehicle (AGV) capabilities. Why is AGV important? AGV allows the operator to build in electronic barriers which the tug will not cross, effectively eliminating the threat of aircraft going overboard. Towbarless tugs offer unparalleled turning radius, which is an absolute lifesaver on a ship. With so little room to maneuver, having the capability to turn with a zero degree turning radius changes everything. The space savings which makes towbarless tugs so appealing in MRO facilities and hangars can be the difference in housing 74 and 78 aircraft on an aircraft carrier. The towbarless tug offers capabilities which cannot be imagined in a traditional tug. Towbarless tugs take up very little space. In fact, given their extremely low profile, it is possible to imagine a very enterprising venture could construct shelves to “stack” multiple units in the space it would take to house one single tractor. The towbarless tug is much more secure in attaching to the aircraft. It cradles the nose tire and locks onto it, essentially encapsulating the entire strength of the wheel and axle assemblies. Traditional towbars actually attach only to a couple of small tangs which stick out of the nose landing gear assembly. Comparatively, this is a highly insecure attachment method. The towbarless tug is a fully sealed design, designed with harsh conditions in mind – the perfect navy ground support equipment. Conversely, the traditional tractor tug is designed more like an automobile or farm tractor. While plenty durable for landside operations, there are some significant weaknesses on a ship, not the least of which is water in the fuel. These tugs rely on fuel in addition to the other sorts stored on the ship. They need motor oil, filters, belts, hoses, coolant, and tires. An electric towbarless tug requires none of these items. It is a sealed design and requires nothing more than access to electricity. Personnel constraints are tight in ground military operations, and much more so on a ship which has finite space to house personnel. Traditional aircraft tugs, even when used on a smaller aircraft as are normally found on aircraft carriers, still require a crew of several members to safely move the aircraft. Through the use on a remote controlled tug, that crew can now be reduced to a single man. With a very limited personnel count on a ship, freeing up three people from a menial task like moving aircraft to do more technical tasks is an enormous asset. Unlike traditional tractor tugs which require a unique tow bar for each different type of aircraft, a remote towbarless tug adapts to all different kinds of nose landing gear. Whether it has a single nose tire or dual nose tires, fixed wing or rotary winged (helicopters with pneumatic tires). More useful is that anyone can easily learn to use the remote control tug including aircrew members. This is extremely useful, particularly on smaller vessels where personnel constraints are even more pronounced. In practical terms this means that additional equipment which had previously been necessary can now be discarded for a single unit which can tow the entire fleet of aircraft with no additional tooling or attachments. When space is a premium, any opportunity to save space and weight is a great turn of providence. With all major components being sealed for moisture resistance, the remote tugs are designed to persevere in all of the worst environments in the world. There is no fuel or oil to contaminate, you will never need to wonder if it is going to start. Diesel engines are notoriously temperamental in cold weather, a fact which is detrimental in operations in cold waters. The only option there is to leave them running, wasting fuel and posing the risk of the tug breaking lose. Electric remote controlled tugs need only be taken off the charger and turned on and they will run reliably, no matter the conditions. They require no warm up period. They stop faster and more precisely than traditional tugs. Also, when towing an aircraft they have much of the weight of the aircraft directly above their brakes which allows much more positive braking. Traditional tugs rely on the brakes of the vehicles, which weighs much less than the aircraft. On an icey aircraft carrier deck, this can easily spell disaster. The weight of the aircraft will simply push the tug, taking both over the edge. But the towbarless tug will gain much more stopping power and tends to stop on a dime. Traditional aircraft tugs have done a thankless job for a long time, and done a good job of it. But in the high-stakes world of naval aviation, technological advancements should be embraced where they lead to serious and proven advancements in safety and performance. The towbarless tug offers just such an advancement. It allows for rapid training, ease of use, almost no regular maintenance, and very little space to store. No additional fuels are required for it, just access to electricity. The time has come to embrace technology in your naval flight operations squadron. Get in touch with us and see what we can do for you!